This is a recycled post from 2014 with up-to-date additions in red. Today is my six year anniversary of being abstinent from sugar, flour and alcohol. I remember the moment I realized I was fat. It was a rude awakening to hear Dave Lamb infer it on “Come Dine With Me South Africa” and I was blown away by his cheekiness. I was in a room full of people who were watching the airing of the TV show and cheering me on, even though we all knew I hadn’t won. At the very end of the show I declared “It’s over!” to which the narrator said “It is now!” as I laughed. We have a saying in America – “It’s not over until the fat lady sings.” I was laughing my melodic laugh, a song on most other days – Most other days where I’m not called fat on nation-wide TV. “Does he mean I’m fat?” I cried out loud - no one knew what to say. Not even Mario. Mario had been in one too many of these situations and it was no-win for him. He could see I was hurt and just smiled, encouraging me (as did everyone else) that it was a joke about my laugh, not a crack about my weight. Somehow I got over it, but it always stung every time I re-watched the episode. After all, I knew what the narrator meant. Even after the episode of Come Dine With Me aired, my eating habits didn’t change much. After all, my husband loved me madly, I had a lot of good friends who supported me, and I was still a great hostess. My family has always been very supportive of me and wanted me happy, no matter what. Weight wasn’t a factor in me being loved or feeling loved, and yet, the truth was this: I was overweight. My husband’s opinion would not change that. Neither would my family’s or my friends. After moving back to America, I took stock. I left my personal trainer behind in South Africa, I was starting over in Sacramento, and I recognized the crossroads in front of me. I had never been ready admit to myself until April 22, 2013. On that day, I decided to get the weight off, once and for all. So, I did. I’ll keep it off, God willing. I know the patterns that made me overweight in the first place. I have the ganas, the desire to beat back death and sickness and the lies that used to live in my brain. I am currently in the process of being transformed and restored. 1. I got honest with myself. I was overweight by anyone’s standards. Even though I’d never put a lot of faith in BMI charts, they are a good place to start in determining if I was truly overweight. A healthy human adult should weigh a certain weight for the height that they are, unless they are a bodybuilder or a gymnast. I was neither. I was overweight on most days, using most scales, during every season. The reason I was overweight wasn’t because of my genes. It wasn’t because I was fifty and had an early hysterectomy. It wasn’t because I had supreme cooking skills and a lifestyle of hosting so many people in my home. I was overweight because I ate whatever I wanted when I wanted it. I had rules for my overeating and they made sense to me: I was allowed to splurge at parties, on special occasions, on Sundays, bar Mitvahs, etc. My permission slips to overeat were surpassed by morning-after regrets, where I stood on the bathroom scale and vowed to eat clean, healthful foods from now on. I tried to eat right, I really did. I tried every weight loss program ever, and my weight loss was temporary, returning once again, when I gave myself permission to eat what I wanted. I actually had a deeper problem – a terrible self-image and a nagging feeling that I didn't have enough of...whatever. Overeating was only a symptom of this problem. 2. I learned about food and the power it had over me. A person who is overweight usually has other health concerns. I had chronic asthma and took my inhaler wherever I went. I had antacids at my bedside, in the kitchen and near the TV. When I decided to follow an eating plan that fed my body (instead of my taste buds) I started taking care of the Janet who lay dormant inside of me. I studied the body and hunger, watched movies on nutrition, shopped for organic produce and fresh, whole foods. I started paying attention to which foods satisfied me most. I added gooey things, like aloe vera and chia seeds. I measured my portions and didn't get seconds, ever. I ate three meals a day and nothing in between. I had scientific proof that the food I was eating was enough to sustain me. The first few weeks were brutal. My emotional response was very bad and I felt “hungry” all the time. The truth of the matter was that I was coming off white sugar and white flour–I was an addict to both–and the addict inside me demanded her fix. Most of the time I was “hungry” I was tired - I needed rest. I tried to lay down every time I was hungry. It was excruciating, but I did it. Once I admitted I was an addict, I was okay knowing that. I had to start somewhere. 3. Alcohol had to go. Alcohol is a food. It goes into your mouth and is processed by your several systems that keep your body moving. When I decided to be honest with myself I that included that I would have to be honest about everything that I was ingesting. I suddenly was confronted with addictive patterns that didn’t belong in my life. I had been using food and alcohol to tranquilize my pain. I never processed the pain that was causing my compulsive patterns. Food I couldn’t eliminate, but alcohol I could. I gave up the best red wine, the finest martinis and said hello to water. Tea. And I still haven’t said goodbye to Diet Coke. A friend who has watched my transformation up close suggested that I watch a documentary on aspartame. I groaned, knowing she was right. 4. I had to process sources of pain that caused behavior I didn't want in my life. If I had to be honest and weigh and measure my food, AND give up the hooch…. I had to begin a journey into the center of my soul and start dealing with emotions and pain that I didn't like talking about. The journey of processing pain, forgiving, and then moving on, is not done overnight. It's exhaustive and exhausting, but much better than plastering assorted wounds without paying attention to why they are there, and addressing why they're not going away. The funny thing about wounds is that they cause behaviors. I was stuck in these behaviors: acting angry or wounded when someone said something wrong, carrying hurts that I didn't deserve, needing attention at inappropriate times. I had real wounds inside of me that I wasn't taking care of, and they were bubbling up into my daily life. If I had to be honest, I would have said that I don’t have time to take care of them, or I didn't know how. On top of that, I was taught that if I believed God fully, my wounds would just disappear. I've learned how to participate in a lifestyle of healing my wounds--working together with God, so I can fully understand the process. When I do this, I am less likely hurt others that I care about. My new lifestyle included a lot of honesty, humility and reflection. I'd lived a life that discouraged looking within too much, so I had to give myself permission to tend to my own wounds. I'm a work in process. 5. I had to be accountable to someone safe. What would I do without friends? I have so many who are lovely and loving – they genuinely care about me. One of my friends is my official “bullshitometer” on this journey. I can squeak past most friends with my old patterns, but not her--she had recently started a similar journey herself. She had a similar moment of awakening and, like me, was confronted with painful patterns in her own life. Because of her journey, she can relate to mine. We both are becoming “filled with sanity” little by little. Because of her, I can be honest about my deep emotions and my food battles. Even sobriety and self-awareness can’t hold a candle to the beam of the truth that comes from a good friend. She understands the truth behind the truth. 6. I have rediscovered God. Oh, boy...confessions of a missionary. In all the years that I've “served God”--and I mean this in the most humble way--I had neglected my true love. 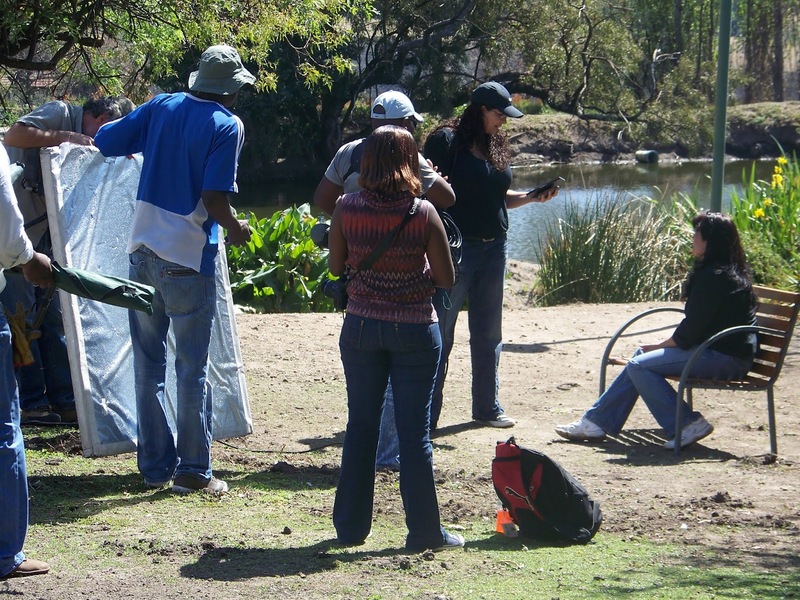 I loved being busy doing good things, but forgotten about the reason why I was doing them. He is my first love. This rediscovery of faith has been very personal and private, but very real. It's happened with grace and with love. I'm opening the doors of rooms I'd forgotten all about, by God's grace, and have been receiving with love…true love. I get shy talking about this, mainly because it's about such a personal thing of how I am intimate with God. I spent years running around doing things for Him, even in His name, and now I realize that He wanted only me. That’s refreshing. 7. I started practicing gratitude. The antidote for the poison of “never having enough_____” is gratitude. It doesn't matter what you think you have too little of, gratitude is medicine. Gratitude allows us to count our blessings, be content with slow progress, and celebrate minor victories. When I came home to the United States, I swore I would eat mounds of pizza and heaps of Mexican food. My new lifestyle is in conflict with overeating, so this hasn't happened, but I'm grateful for raw and organic foods that abound here. 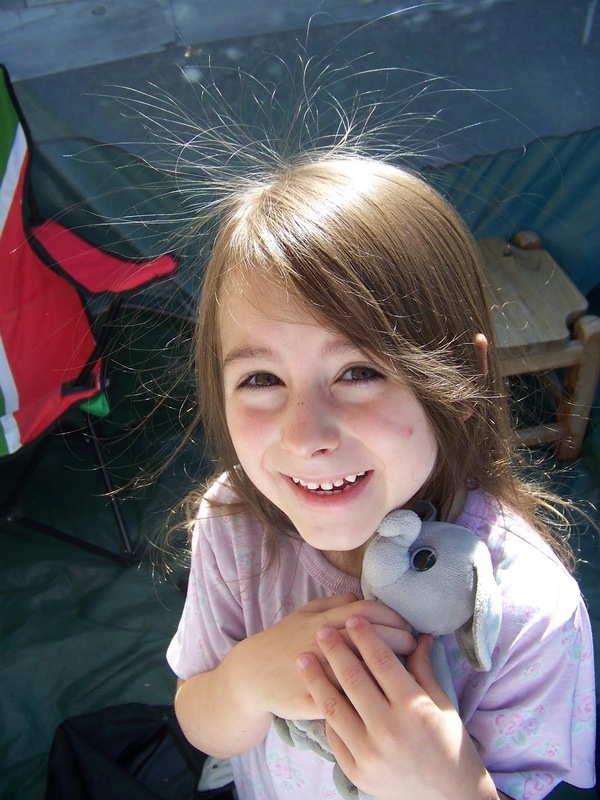 I'm grateful for a grandchild's smile and streams of sunshine. I have to remind myself that inhaling and exhaling are gifts I’m not entitled to. I practice loving things that before I would complain about. I adore raw red cabbage. I love raw cauliflower. I'm grateful for beans and legumes. I've got a long list of things I can't believe are mine. I have to say it over and over again several times an hour. Thank you, God! I am grateful. The journey has just begun, six years later, it's ongoing, but I can tell you this: It has been three months since I started a journey of being kind to myself. In those three months I have lost thirty pounds (13.6 kg’s) in six years, I've lost a total of 50 pounds - or 22 kg's, but more important than this, is that I've kept it off for six years. It's a day-by-day process, but I'm incredibly grateful. I have a graveyard of unused inhalers, I don’t even know where Mario keeps the antacids and I haven’t washed a martini glass for three months. I have not had a drink of alcohol in SIX YEARS--not one drop. Praise God!! Instead of feeling deprived, I feel free. If I were honest, the best reward is being free. This is still true, even after six years. That revelation is an example of irony, a funny one, that makes me laugh--but now no one says that the fat lady is singing. This blog is about my mother, Jennie. There is an old adage that seems to be true: mothers and daughters cannot truly see or know the other as a person. 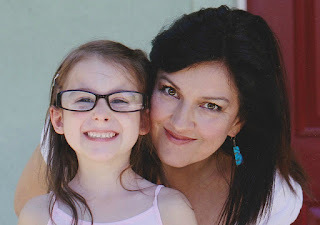 Because mothers and daughters are so closely connected, their mutual unknowability and inherent blind spot might come from proximity or having expectations. The normal personality differences usually result in a mother-daughter dance that lasts forever, a dance that unintentionally upholds the tender relationship where we share and protect our hearts with and from one another. My mom is peaceful, serene, and logical. She loves justice but also uplifts peace. 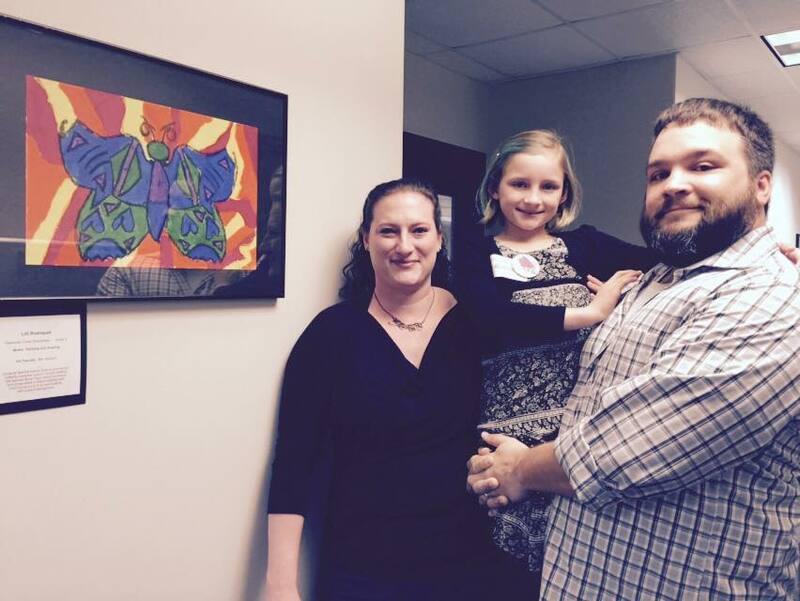 She’s honored first her parents, then her husband, and then her family. In all of my years with my mother, she’s never badmouthed any of them—because she treasures these relationships. 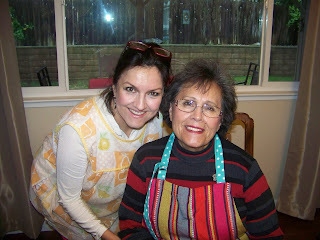 She rolled up her sleeves and shared her skills, recipes, stories, and values effortlessly while we were growing up. She taught me about proper boundaries before that word was even part of the female vocabulary. And most of all, she taught me how to be a good woman just by living the example right in front of me. As a young woman, she was Tracy’s Tomato Queen, riding on top of an elephant in the middle of our small town. Not long after, she met and fell in love with my father, Jack Ryan, an Irish-American from Boston. 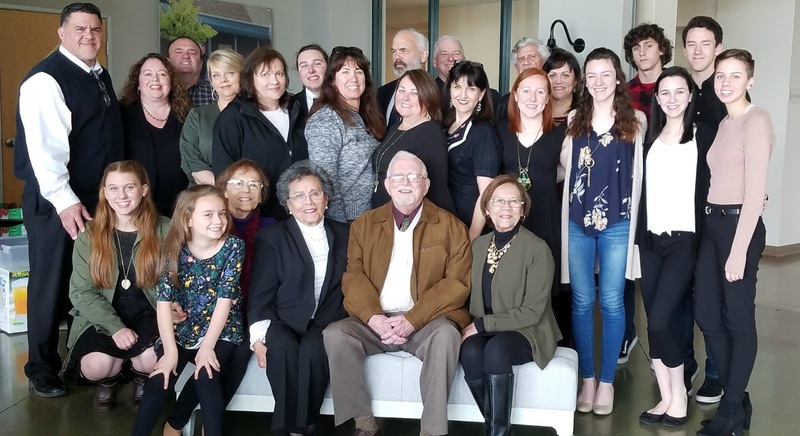 Together, they had five children—Patty, Janet, Steve, Shari, and Colleen—their first grandchild (my son, Vince) was born before Colleen finished high-school. Our children know her as Grandma and now my Grandchildren know her as Great-Grandma. Time flies! My Mom is a woman of endurance and peace, but she sure knows how to fire up the joy, especially when it comes to gatherings. This past year I’ve been compiling a family memoir of my mother’s family, the Gonzalez family, immigrants from Mexico. In this process, I’ve been able to know more and more about my mother. I am in awe of how carefully she’s navigated through life, how each step has been done with care and gratitude. There are many times I’ve watched her walk through things she never should have walked through…and she’s been faithful to stand up and walk. 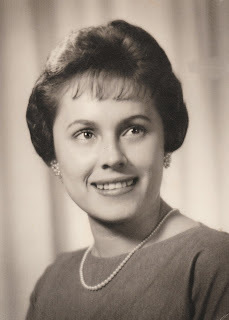 My Mom’s beauty is much more than exterior—it’s a beauty that radiates from her heart. The days she’s given me are priceless, and when I look back, I see rivers of love, flowing from her heart and spilling into my life in every season. She has given the same love to all of our family over the years, faithful to be there in every way. She continues to surprise me. Happy Birthday, Mom! I love you, and am pleased to dance with you! There aren’t many guidelines for loving grandchildren, because it’s an easy love. It’s a love that suddenly cheers you, a favorite song that plays when you’re standing in line at a store, or the DMV. Grandchildren are the music of celebration, the dance of connection. 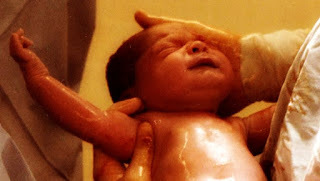 Each grandchild is a unique symphony, with movements depicting different seasons, or stages in their life. 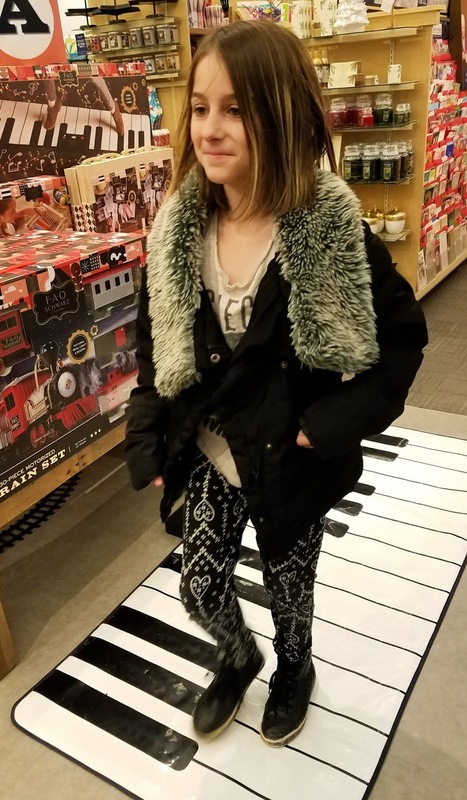 Our granddaughter, Lauren, is a young girl who moves constantly, an ongoing narrative symphony, like Sergei Prokofiev’s Peter and the Wolf,. Sly, fun, mischievous, and expansive, Lauren’s life is filled with flutes and timpani, warning us that change is coming; something big is about to happen. 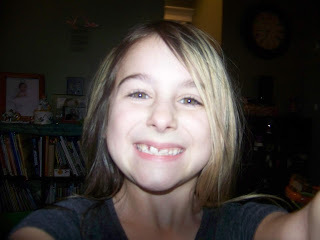 This is Lauren. She’s the something big that is happening—the tale well-woven into music. I still remember the day she Lauren was born. Like her siblings before her, she came into this world through my daughter-in-law, Lennae, when she was at home in a birthing hot tub. 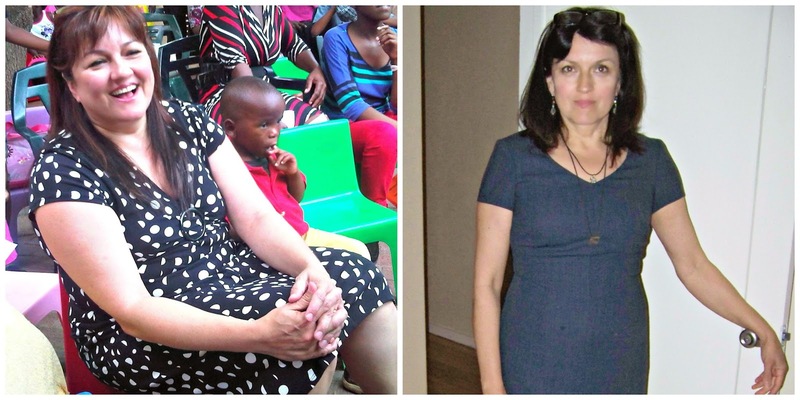 I saw pictures, in full color—Lennae and David cuddling, Cathy (mi comadre) close by, and the midwives ready to help—from our kitchen counter in South Africa. The longing I felt as I looked at the pictures via email filled me with admiration, love, and a sad emptiness. I wanted to be there—to at least hold Lauren—but I knew it wasn’t possible. 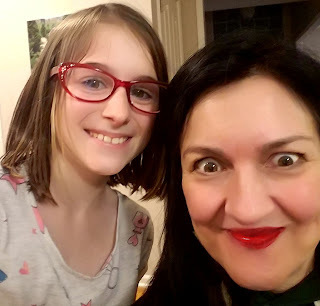 We moved back to the USA when Lauren was four-years-old, and even though we made trips home to the USA to see her, she barely remembered us, and so we began the business of reconnecting. It didn’t take long to realize that distance is distance—we lived in California and David and Lennae’s family lived in Kansas. When we visited Kansas as often as possible, where I selfishly kidnapped my grandchildren, took them to fun places, bought them stuff, and prayed that we would later remember it as shared experience. The miracle of these times were our hearts opening to each other—a beautiful exchange of time and ideas in the minutes together. We played, took pictures, told stories, colored, and made a big deal about being together. Of all of David’s kids, Lauren was the one with limitless energy. She could move faster than all of us, get brighter ideas for creations and games, and invent better ways to do things. She was unlike any child I’d ever met. In the years I have been her grandmother, Lauren has grown from a little ball of energy and fun to a bigger ball of energy and fun. She is always, always ready to have fun. One year, during a visit with David and Alicia’s families, we had family pictures taken. She was on the porch with me, and after I had put my glasses down, she picked them up and put them on. “Now I see what you see,” she said. The picture is on my wall—a memory of Lauren that is cemented in my heart. Lauren is trusting, hopeful, filled with gigantic expectations of life, and makes me smile when I think of her. Oh, and she loves gross-looking stuffed animals now, ones that freak out her sister, Lilli. I wish she would give poor Lilli a break…just for one day. I once read that the baby of the family is loving because all of the family love trickles down to her—and I find this true of Lauren. 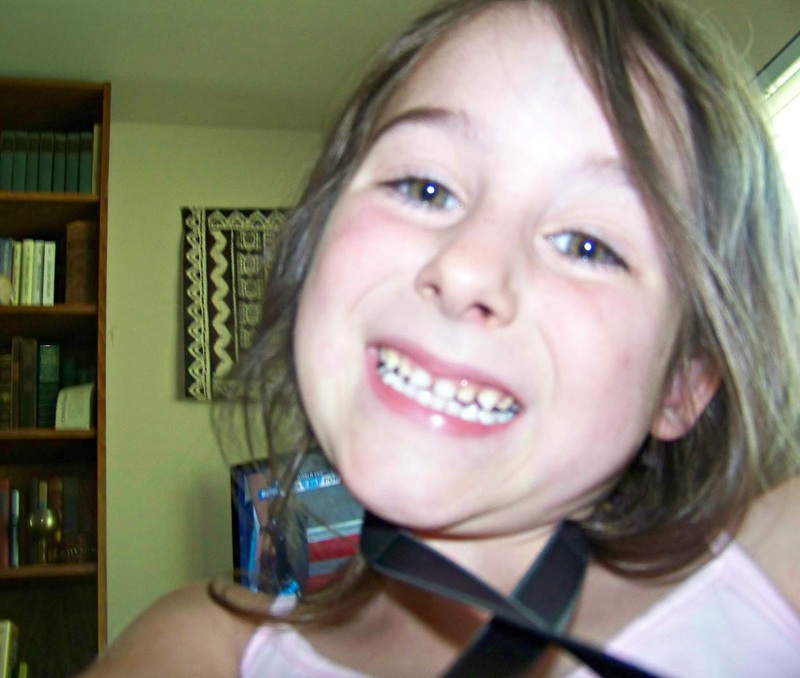 Today, Lauren turns ten. I can’t believe it. I cannot believe it. She’s into the double digits? Really? There aren’t many guidelines for loving grandchildren, but on their birthday you are forced to remember how quickly time goes by. The love I feel for Lauren swells in my heart (like the final movement of Peter and the Wolf) and spills over, breaking into bits at the thought of life and its many changes. 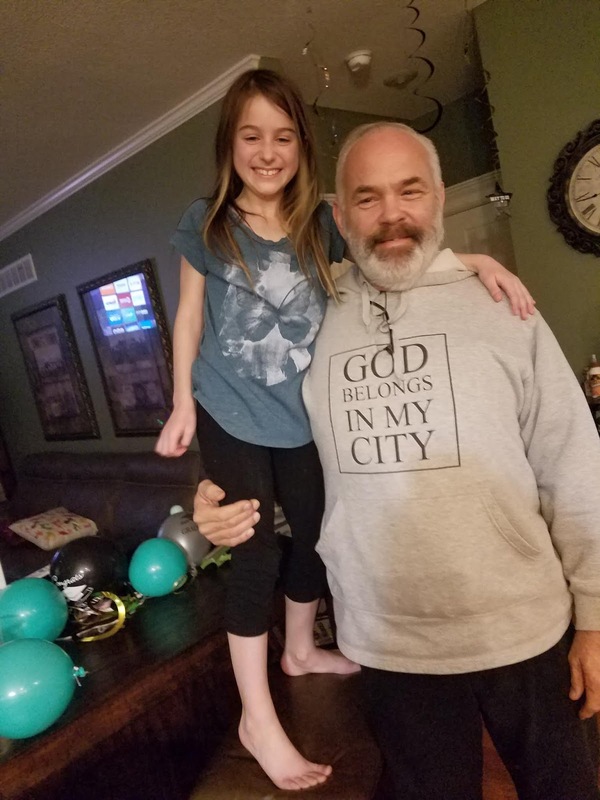 Lauren, as much as I don’t want you to grow up, I want you to know that you are a joy to all of us at any age. I love you! You are unique and wonderful and see life as a beautiful challenge, calling you into it! May I please borrow your glasses? Labels: Happy Birthday, Lauren Caroline! Four open books, two spiral notebooks, the year-end issues of The New Yorker, The Sun, The Paris Review, a cup of tea gone cold, a bottled water mixed with microgreens, and two new coasters I got for Christmas are part of the clutter on my desk, all of which distract me as I type. I look across the room at Mario’s workspace, neat and organized. His daily planner and a sharpened pencil lay next to his marble-base desk lamp. I need his help. Tonight, exhausted with a bit of writer’s block, I call out to him across the hall. “Yeah?” he answers from our bedroom, then comes into our office. 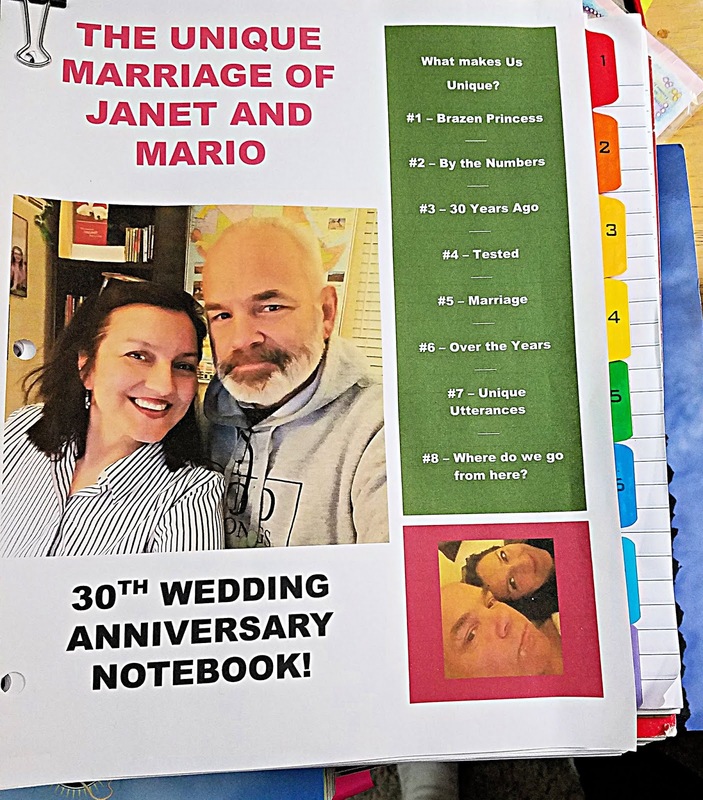 He thinks, then walks to the vertical files next to his desk—where manila folders are sorted alphabetically—and grabs a book—made from letter-sized printer paper and separated with tabs—that he gave me last year on our Anniversary: The Unique Marriage of Janet and Mario. He hands me the book and kisses me, encouraged by my enthusiasm. He gave me this book last year at this time, but in the busy-ness of the holidays and the exhaustion of graduation, I forgot where we put it. He created the book for me—for us—with his whole heart. It’s half-memory album, half-statistical research that mathematically proves how we are unique and special as a couple. I can’t stop smiling. It has been two hours since I started this blog; I’ve been looking at the book ever since. Mario is now relaxing outside, bundled up in winter clothes, drinking a hot cup of raspberry tea (with a scotch chaser), smoking a good cigar, and playing a mindless game. I am supposed to be blogging in here, but I am remembering why I love him. I am not supposed to be this distracted—but I love this 30th Anniversary Notebook. I wish Mario was here sitting with me so we could look at it together. The book is divided into eight sections: 1. Brazen Princess (a commemorative blog I published on the day we celebrated 30 years); 2. By the Numbers (my favorite section—I’ll tell you why soon); 3. 30 Years Ago (What was happening in the world in 1987, the year we married); 4. Tested (trivia quizzes that test how much I know about our time together); 5. 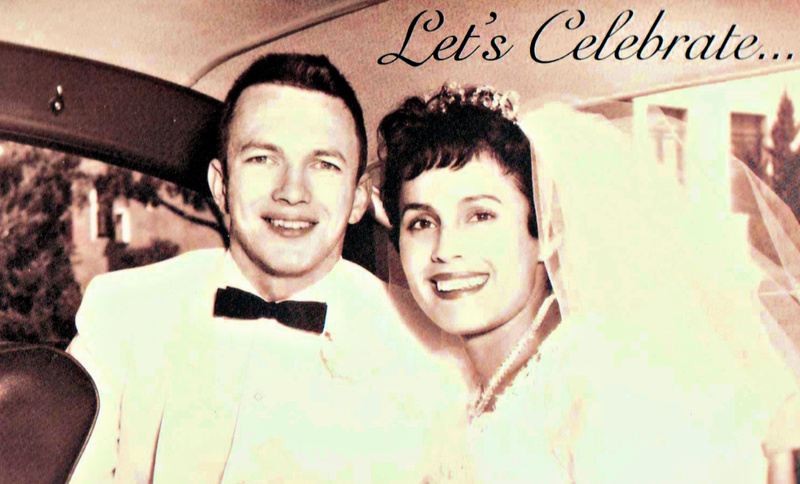 Marriage (articles and letters from and about couples who have endured); 6. Over the Years; 7. Unique Utterances (We love to quote each other); 8. Where Do We Go From Here? (a challenge to us to continue adding to the book). 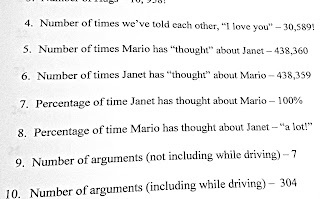 As I read The Unique Marriage of Janet and Mario, I remember falling in love with Mario, more than 32 years ago. 30 Years Ago: What was happening in the world in 1987, the year we married? In 1986 I had just come out of a turbulent, destructive relationship. I needed a job so that I could support my new baby (Vince) who had just turned one-year-old. Since I didn’t have a college degree, my job-options were limited. I took a job at a local State Park as a Park Aid—Mario was the supervising State Park Ranger. Mario was a very good boss and recognized that I was a good employee—able to do more than work the entrance kiosk and perform low-level office duties. One day, Mario handed me two large books—DOS Manuals—and told me to learn everything and explain it to him. I did. Later that week, after learning Multi-user DOS commands, I taught Mario and all the other Rangers about the new PC, including what prompts and commands were. I didn’t know then, but this knowledge of DOS would later help me build a quasi-career. Mario genuinely liked me and believed in me. 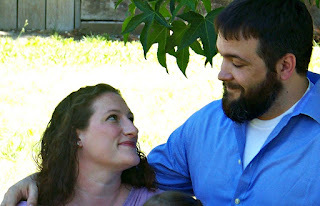 We were both single parents and had guilt about failing our former partners, and ultimately our children. Nevertheless, I didn’t really think of him romantically. He wasn’t really my type—even though he was incredibly gorgeous and hilarious—an athletic, Republican, introverted, logical, moustache-cop. He was also much older than me (I was 23, he was 32). By the time I realized I was falling in love with him, I also had to admit that he was way out of my league. Then, after work one night, I asked Mario for advice on a parenting matter. He offered his opinion as a friend, not my boss. The subject matter led us into deep conversation, and when it was time for me to go, he walked with me back to our cars. I almost said no. I knew I was in love with him and I knew if we hugged he would be able to tell. But we were drawn together like magnet and steel. I fell into him, my face against the warm glow of his neck, our bodies fitting together like puzzle pieces. It was like heaven opened and the skies parted and angels came down and drenched us with stars and music. When we let go—about two minutes later—Mario looked at me, stunned. This is still one of my favorite “unique utterances” of Mario’s. After the hug, we had to rethink everything, including our workplace. We had chemistry that was unlike anything I had ever experienced, and it was very hard to ignore. I had hope that our relationship was something more than just physical attraction. We worked well together, knew each other’s values, and most importantly, we had already seen our long-term relationships fail and we didn’t want to repeat the past. Thoughts of Mario constantly danced in my head. 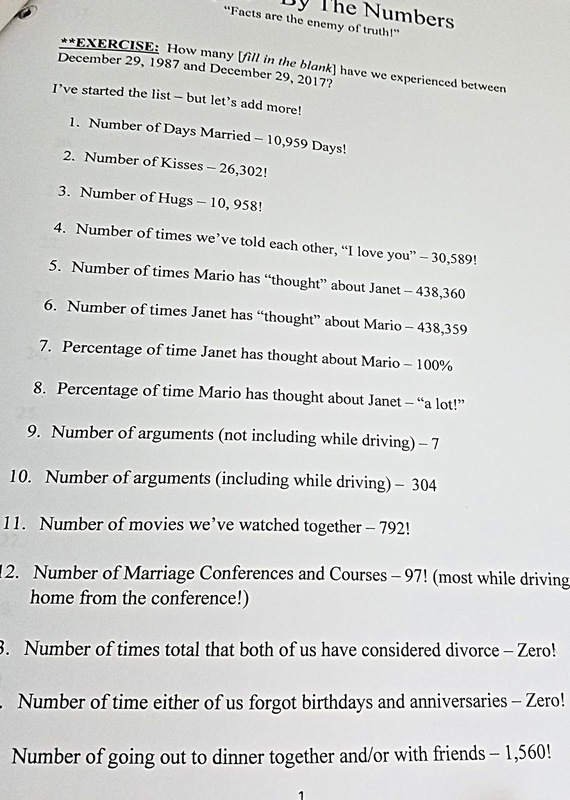 One day, not long after we had agreed to take our new relationship seriously, I was cleaning the office and thinking about how much I loved Mario. We had already told each other “I love you” and were still in that blissful state of newness and realization. Because the office was quiet and the other ranger was out in the field, I decided to cross a major boundary and go into Mario’s office and tell him I loved him—again. When I stood in his doorway, he didn’t look up, but continued typing on his desktop PC. Because I was so 23, and believed every Cosmopolitan article I ever read about a woman’s ability to derail her man with body movements and innuendo, I wasn’t discouraged. “Um,” I said, trying to look coy. “I was curious about something.” I walked over to his desk and knelt down next to him, an action which made him uncomfortable. Nevertheless, I persevered. “I think of you all the time,” I whispered. “How much do you think about me?” I was smiling, excited to be close to him like this at work—it felt forbidden and dangerous. Instead of the Cosmo reaction I was hoping for, Mario looked up to the office ceiling. Mario’s businesslike answer was clearly meant to sober me up, which it did. I stood up, feeling foolish, and started to leave the room. He stopped me. “I’m serious,” he said. “I’ll think about it and get back to you.” Then, he returned to his work. I tried to keep busy the rest of the day, as Mario continued to type away in his office. I chided myself for my immature behavior. Mario and I had agreed to keep our work environment professional and our relationship on the down-low. That afternoon, I was too embarrassed to say goodbye. 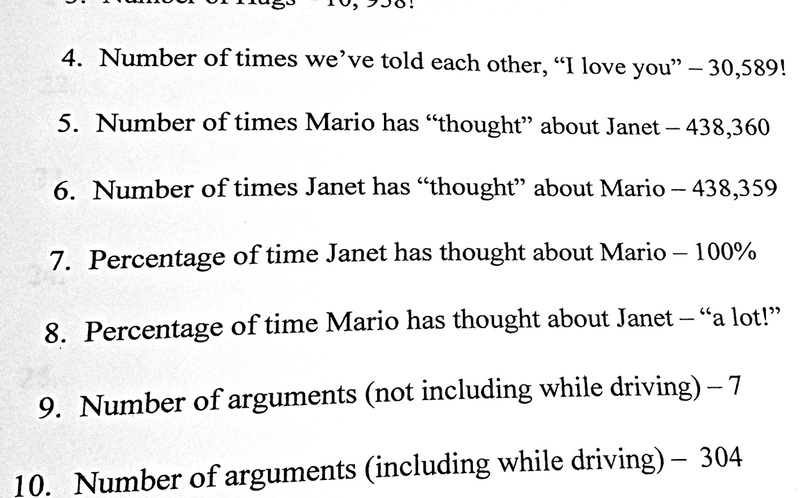 “But I’ve been thinking about your question,” Mario said. I heard him stand up and then he appeared in his doorway. By now, all of our coworkers had gone home, so he seemed less guarded. “You asked how much I thought about you, and I was thinking it’s pretty close to ten per cent of the time.” He smiled triumphantly. Because I was already embarrassed, I didn’t feel like joking around. From the way he was watching me, like he was waiting for my reaction, I suddenly realized he was serious. “You think about me ten per cent of the time?” I asked, letting go of the doorknob. The door closed behind me. Mario nodded, but he seemed to notice that his answer offended me. “That’s a lot!” he said, ready to defend his answer. “Ten percent of the time is a big chunk of my day.” He looked in the office cubby holes for new messages or mail, almost nervously. I had never before seen Mario nervous. I left, and he didn’t try to stop me. I made the long drive home, crying big, hot tears that I couldn’t stop. I knew that Mario didn’t love me like I loved him—the kind of love that makes you want to marry that person. By the time I picked Vince up from the babysitter, I was a mess—and this whole thing was breaking my heart. I walked in the door and my Mom told me that Mario had called, very concerned about me. I froze. Was he joking? There was silence on the other end of the phone. I wasn’t sad anymore; I was angry. I went to work the next day, accepting that Mario and I were not meant to be. When I got to work at 8:00, Mario was already there—he wasn’t scheduled to arrive until ten. “I need to talk to you after you hang the flags,” he said, authoritatively. He stood up straight, looking a little like Chuck Norris. After I hung the flags, I went into his office. He shut the door and asked me to sit down. When I did, he took a manilla file folder and handed it to me—inside was a pie graph. The pie graph was literally drawn in pencil and crayon, since Mario had young boys with their coloring stuff at his house. He had color-coded the graph to show how he saw the division of his time. I smiled, which relaxed him. He pointed to each piece of the pie graph, showing me how logically minded he was. As he spoke, I wondered about something: what if Mario was serious? What if twenty percent of the time is a whole lot? What if I have a logical man who will not lie to me just to make me feel like the heroine in a romantic comedy? I wasn’t sure what I was going to say, but I suddenly wondered if this man in front of me, showing me a crayon pie graph that took a lot of time to think about, measure, and present to me… what if he really did love me? That would be the best thing ever. 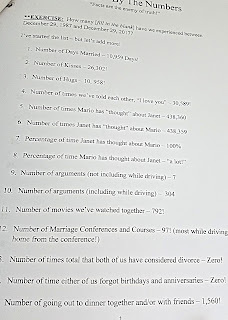 So, you see, "By the Numbers" is my favorite section because only Mario can make numbers soothe me. This section shows me that even statisticians can learn how to schmooze a woman, after years of living with her. Today I am 56 and I will love this year. A friend once asked me why I write. I told her that there are two reasons. 1: I have to, or I’ll explode; 2: It’s the only thing I know how to do. I’ve done it since I was in second grade, and have consistently written all of my life. Then she asked me this: “If you had to write one thing before you die, what would it be?” I thought long and hard about my answer. I thought about all of the things I should say, but I had a funny feeling this friend would see through all that. She knows me well. Then it came to me—if I had only moments to live, I would write this: I have loved and been loved so much more than I ever thought was possible. I was born into a family who waited for my arrival—my parents and grandparents loved me. They named me and cared for me and held me until I could walk, which I did, in safe quarters. I have four siblings—an elder sister, a younger brother, and two younger sisters—who I love and love me with the turbulent sibling love of continuous change and growth. Our family is a tree whose branches stretch for miles in opposite directions. I love them so much; we all love each other—despite our differences. After my bumpy adolescence, I fell in love with a man who gave me a son. Despite love, the man and I split up, but I had custody of our baby—a son who I loved more than anything in the whole world. Then I met Mario. That sentence…that phrase is the understated bliss of true love. He is my truest true, the man who loves me more than any human on this earth. Mario had two young sons, so when I fell in love with Mario, they were swept up into it. 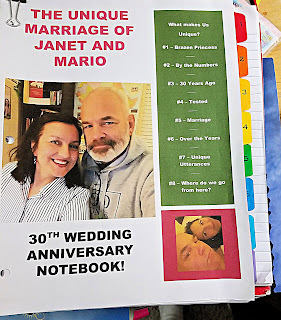 My love for Mario came with such pure passion that I was sure he’d never love the same way, but he did—and we got married (thank God). We became a family—my son, his sons, and a baby daughter we had together—and we became happy together. Any mother can attest to that kind of crazy mother love—the moving ocean of bleeding love that swells out of you—it’s almost painful. I drowned in this powerful love, until I became a mermaid, a dolphin, a shark, an octopus, and an underwater volcano. This mother love is so vibrant that it scares me sometimes. As we’ve grown, Mario and I have built friendships with people who have loved us and sustained us through drought and hardships. They have laughed and feasted with us during times of celebration. We have friends who’ve prayed with us, grieved with us, buoyed us up with their love when we were drowning, and celebrated with us when the disaster was finished and the sun came out. Friendships and love and encouragement…much more than I deserve. And then there’s God, who is over all of this, my God who is faithful when I am faithless. His banner over me is love. And this, as I look at it, is a simple offering. This is what I’d write about if I were dying. Look at me—I am the most ordinary person you could ever meet, and in my lifetime, I have loved and been loved more than one human being should be. And this is why—at 56—I will love this year. It will be a year of even more love. Each time I blog, I start on a blank page, selecting “Blank” page from the selection that Microsoft WORD gives me. This suggestion shows a white page that I fill with characters like the ones you’re reading now. I call this writing. It’s what I like to do because from nothing comes something—a way to reach out and touch you! Here I am. I enjoy writing and these blogs are more than just a post or a share, they’re a piece of me, shared with you. Labels: 56 years old, Happy Birthday to me!, I've been loved more than anyone, why me? Lilliana Grace through the years. Liliana Grace is our grandchild who takes everything in—like an artist. I am her Abuela who takes everything in—like a writer. I see Lilli when she doesn’t think I’m watching her, and vice-a-verse. I like to think we understand each other, artist to artist, in a way that is unique and special. Lilli has always been extremely artistic, winning awards for her paintings and drawings, but recently her art is taking on its own new, independent style. She is almost to the point of not wanting to share something that isn’t ready, rather than sharing it too early. She is a rather private person, thoughtful and pensive, with a wit that can rival anyone’s. 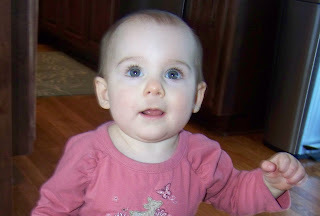 Today is Liliana Grace’s birthday! I will post this at two in the morning in California—after everyone has cleaned up the Halloween paraphernalia and gone to sleep—around the time she’ll be waking up, near Kansas City. About ten minutes before midnight (just before we were going to bed) our internet server went down. Nothing in the house was working and I started panicking. He looked at me and raised his eyebrows. It occurred to me that Lilli will probably not jump out of bed, grab her phone, and head over to Brazen Princess just to read this. She might not even read it at all today—she’s now at the age where homework and YouTube commandeer most of her time. 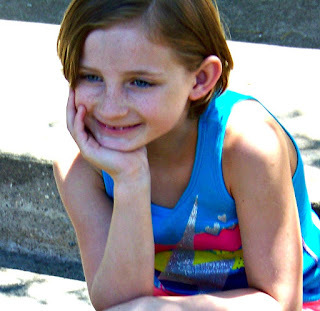 We remembered her together—our blonde, blue-eyed little girl who loved to draw and think of beautiful things in deep thoughts. She screeched when she wrestled around with her siblings and built crazy things out of Legos. She enjoyed stories I made up from scratch, and always wanted butterflies and unicorns in them. The last time we were with her she told me all about twenty-one pilots (a band—who doesn’t capitalize their name because they’re too cool to do so—that is named after an obscure line from the Arthur Miller play, All My Sons) and Panic at the Disco (who actually writes really clever songs). She still drew and painted, but often worked in a book she didn’t show me. She was still the same, pensive, beautiful Lilli—but I longed to French-braid her hair and cuddle with her on the couch, like old times. Tonight, after I read in bed for a while, our internet connection was restored and I went to my computer to post this. I added our memories of her—and realized that in less than a month I’ll see her again and we’ll make new memories. This makes me happy. Today, Mario and I will call Lilli on the phone, sing happy birthday and hear all about how her Halloween was. We will count our blessings, and talking on the phone to a grandchild is a huge blessing to a Grandparent! So...today, my beautiful Lilli...you are another day older, not another year! Love knows no boundaries—especially when the beautiful bridge of art can hold our hearts together. Our love has the power to skip over natural barriers as easily as stones skip over water. Lilli, you are my grandchild, so I think of you every day, pray for you constantly, and carry you with me wherever I go. Because you are so valuable to me, I want to learn more about you and find new reasons to love you. So, when I see you, show me something you made with your new markers. I can’t wait to see! 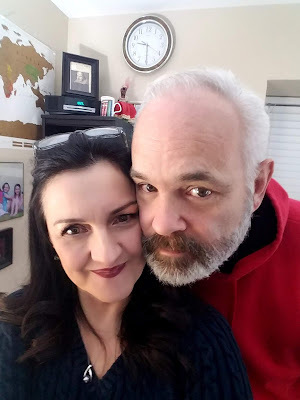 On the day David was born, Mario drove his then-wife, Cathy, in his patrol vehicle—red lights and siren-- to the hospital for the birth of his first-born son. Mario couldn’t stop taking pictures of the baby’s face. He was wet, wrinkled, and astoundingly perfect. To this day, we call those pictures “the face pictures” –a whole roll of 36 pictures he took with his new camera. David is Mario’s first-born son, only five years old when Cathy and Mario separated. Cathy moved to Kansas—to be near family—and Mario stayed in California—being a state employee and rooted in California. I met David at the tender age of six, and we hit it off right away. Since I’d been working for Mario at a State Park, the first time I saw David—and Joe—they were with Mario, all dressed in shorts and polo shirts. They were on their way somewhere, but Mario had to take care of an important piece of business, and walked through the front door of the State Park dressed in civilian clothes and two little boys in tow. “Do you guys want to color at my desk?” I asked them, after Mario introduced us. I was really trying not to laugh—David looked like Mario so much—and I finally had to say something. “Hard to tell this is your son,” I said to Mario, who was sorting through his mail. “Joe looks more like our mom,” David said, pointing at his brother’s hair. “See? 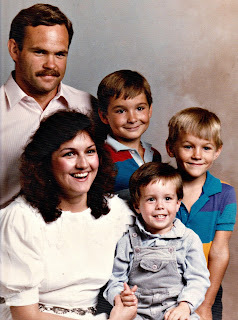 Light hair like Mom and I have dark hair like Dad.” As he continued to tell me what Mom was like, the boys and I drew a turtle on white paper, using crayons I found in my desk—probably left there by the previous secretary, who had kids. Eventually, Mario and I blended our families together, a trend becoming more common in the eighties. David and Joe were part of Mario’s family, just as Vince was a part of mine. 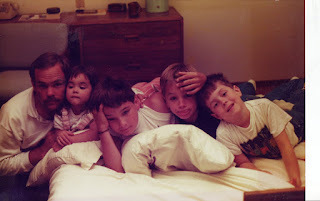 Soon, we had a baby girl, Alicia, who made our boys band together and become big brothers. 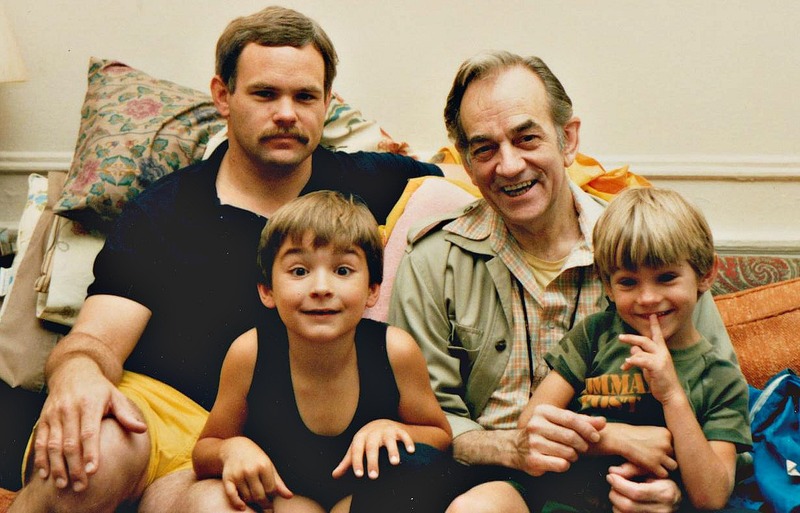 We made our home in California, while David and Joe grew up in Kansas with their mother, Cathy. We would talk on the phone often, and write letters—by hand!—but mostly we lived in a strange state of grief at the distance between us. We looked forward to the summers, when they would fly out and we would take family vacations. 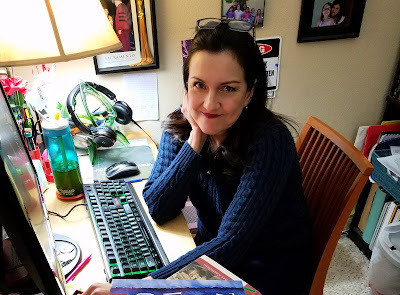 That day at my desk, as David told me about Kansas and Mom, and all of the things that he was planning to do in the summer, I couldn’t have seen this all coming. David was introduced to computers at a young age—his father's Kaypro, with only two or three games to go with its word processing capabilities—and seemed to understand the inner workings and basic language well. Back in those days, we limited the boys to half-hour slots, and it makes me laugh to think of David now, who spends so much of his time on computers. Behind his work desk, with two or three screens going at the same time, spending hours on end with computers, he knows more about hardware, software, and language better than most people in the world. I couldn’t see that happening either. When David graduated from high school, he came to live with us for the summer. Ready to break free of his life in a small town, David prepared himself for college, where he was planning to study astrophysics and pledge to the frat that threw the best parties. 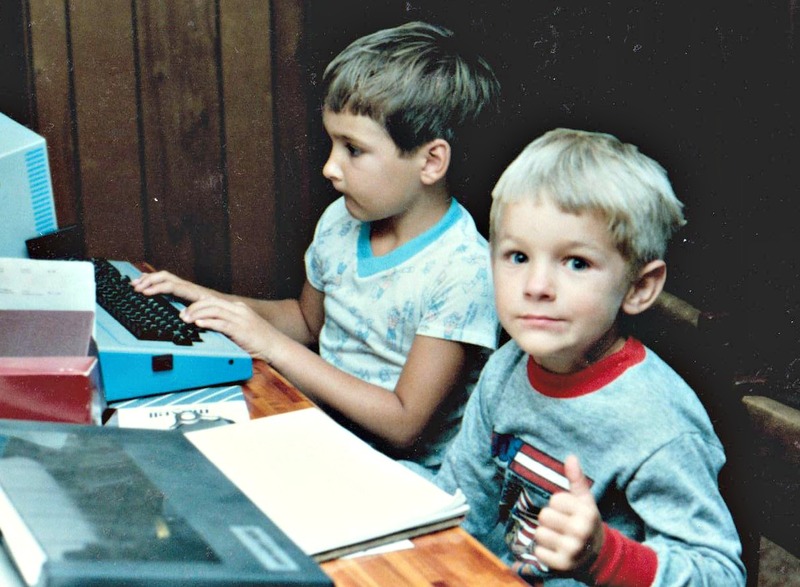 Somewhere along the way, David learned UNIX, an international language that changed his life. He immersed himself in the growing technology of the day, learning the ins and outs of hardware and software and soon was comfortable moving in the professional world. He had found his niche in the world of technology—and he was on his way. After a series of crazy girlfriends, David finally met his wife, Lennae, who was a perfect match for him. They have three children, who were our first grandchildren. These babies who stole our hearts are now teens and pre-teens! The same heartache I felt being separated from David and Joe, I now feel for their children. Here we are in California, and there they are in Kansas. Today David turns 39, which I figured out with my calculator because my brain is in denial. I thank God for David because he is more than a step-son—he is a son to me: a wonder and a beautiful part of my heart. Thank God he is not riding bulls anymore. Thank God he found Lennae. Thank God I love his mother and we are friends. Thank God he loves me as his step-mom and always has. HAPPY BIRTHDAY, DAVID!! You are one of the greatest blessings of our life, and we love you! © Janet Rodriguez 2019. Powered by Blogger.